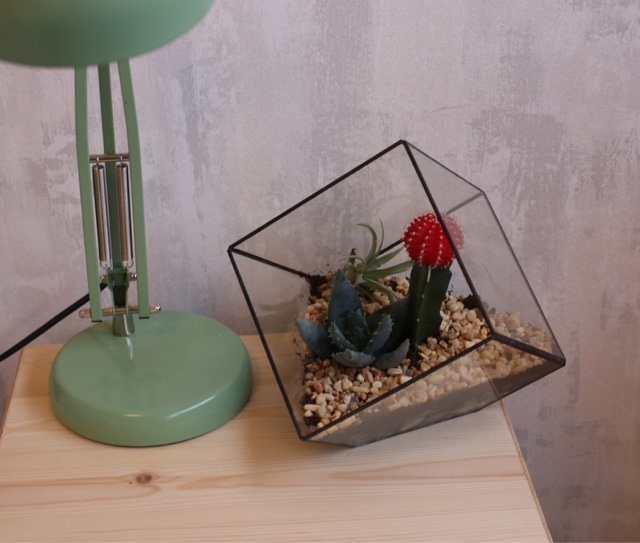 Get Some Zen, Make a Terrarium! 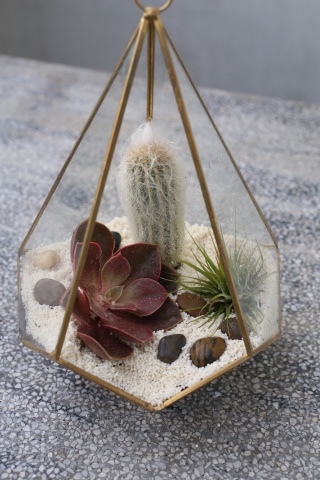 I was shopping the other day at a department store and in the home garden section I came across some stunning glass tear drop terrariums filled with all kinds of succulents and cacti. I immediately reached for one to buy until I glanced at the price tag....£150!!!! That's just a tad over my houseplant budget. Anyway, I went home terrarium free BUT with the great idea to make my own. Below you'll see a step by step tutorial on how you can too! I made four of them which are all dotted around my home now and we LOVE how peaceful and serene they make us feel. Especially waking up and seeing a little bit of nature right next to you. Ahhhhh.....or....Ommmmm. 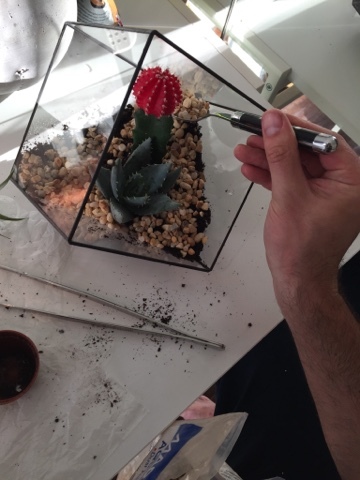 Constructing the terrariums was quite easy though a little messy with all the dirt and sand so make sure you do it on a covered table for easy cleanup. Ps....I got my husband in on the action and I must say we had a ton of fun doing it together. And he's super proud of the one he made for his bedside table. 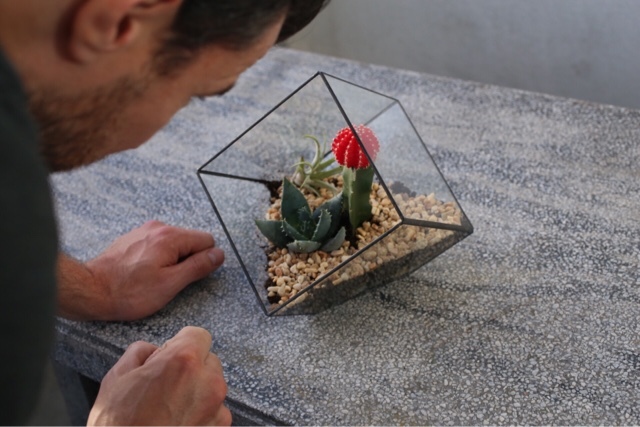 - a glass or clay terrarium container. Should have no holes in the bottom and plenty of room to work with around the opening. 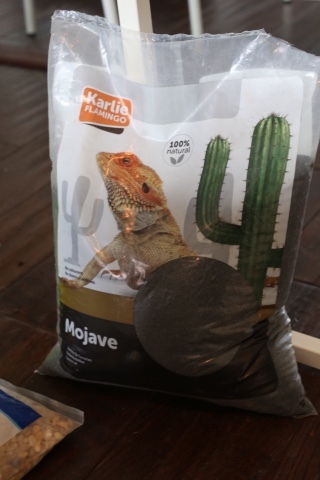 I found a good selection on Amazon. 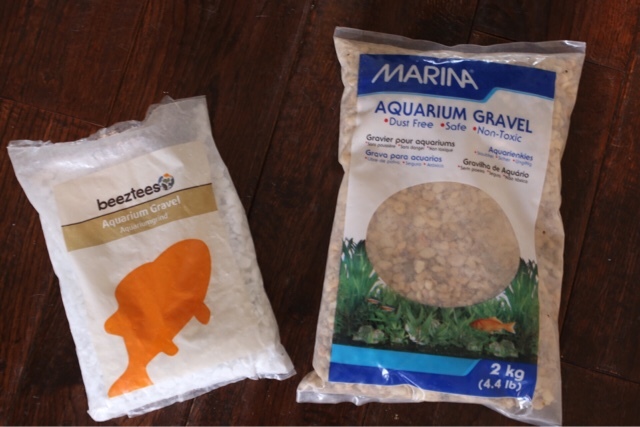 - a bag of smooth pebbles, roughly the size of marbles though they don't have to be perfect spheres. 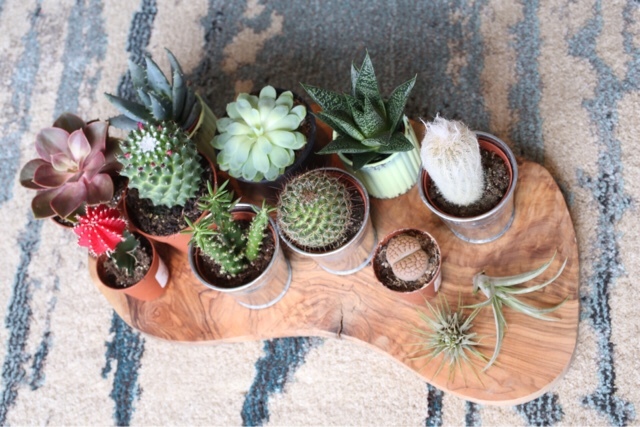 Sift through and choose any cool ones to set aside for the last decorating step. 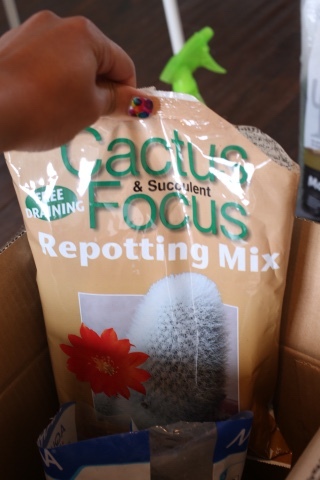 - potting soil for cacti and succulents. 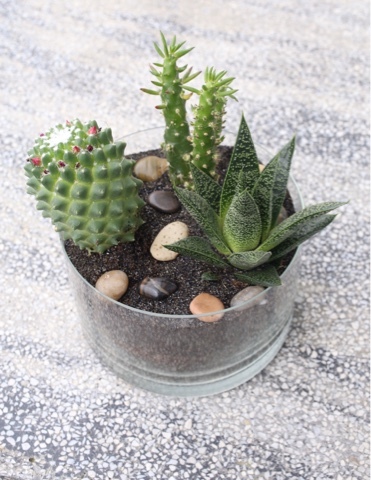 - mini succulents and cacti, about 3 per terrarium unless yours is big enough for more. 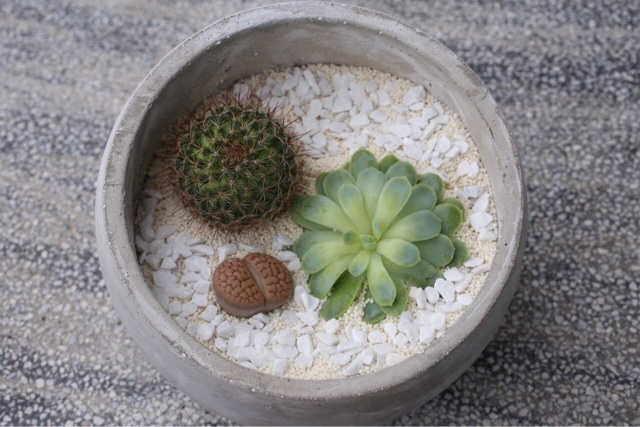 Pour in a 1" layer of the soil on top of the pebbles. Pat it down gently and spray lightly with water. Once all the plants are in place pour in the sand or rubble. I kind of poured mine into the middle then used the small spoon to distribute it evenly over the soil. 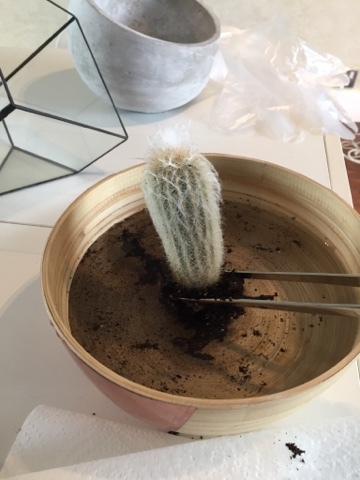 I used my tweezers to pick away any sand or rubble that got into any of the plants. 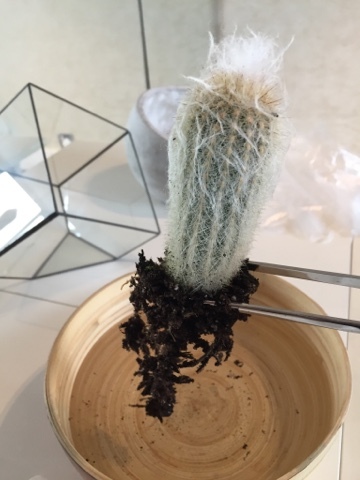 Also, be sure to lift any bottom leaves up gently and push some sand underneath to cover the soil more and make the beauty of the plant pop. 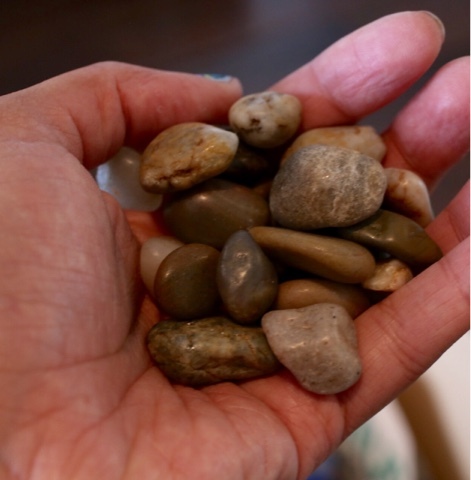 Finish decorating with the cool smooth pebbles you've picked out beforehand and scatter here and there. Now you're done! 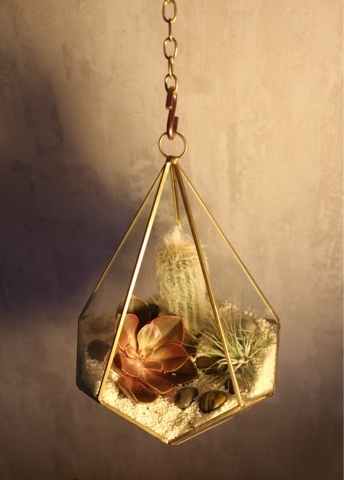 Terrariums are great anywhere in the home. We even put one in the bathroom! And there are extremely low maintenance. Just spray with water once or twice a week being careful not to over water. 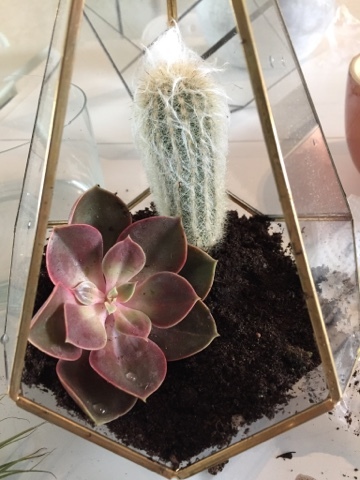 Also, give your terrarium some sun once in a while if it's in a room without windows. Hope this brings some joy and zen into your everyday life! I know! 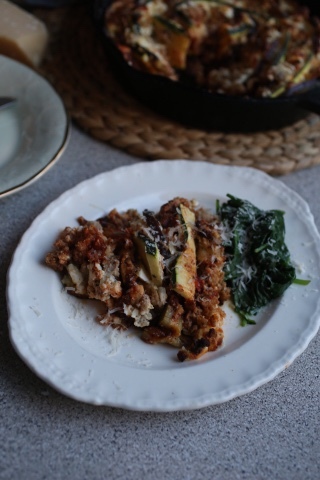 Two recipes in one week! Well my kitchen remodel is finally finished and I am ecstatic so I've been trying out all of my new appliances like crazy and the result is lots of new recipes to share with you fine people. Anyway, I am a huge seafood fanatic, especially shell fish. Like, I would literally die if I found out I had a shellfish allergy. Since moving to London I've found it hard to find my ultimate fave crab legs so I tend to eat a lot more lobster these days. I know, poor me. But hey I always buy lots of it on sale and freeze whatever I'm not using. 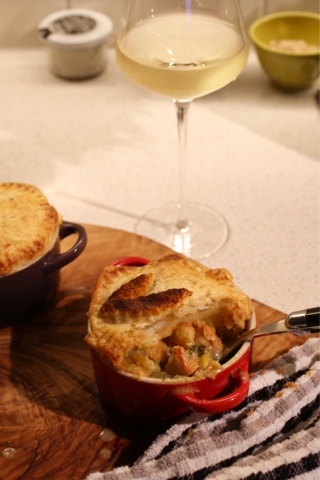 That brings me to my new recipe.... lobster pot pie!!!! 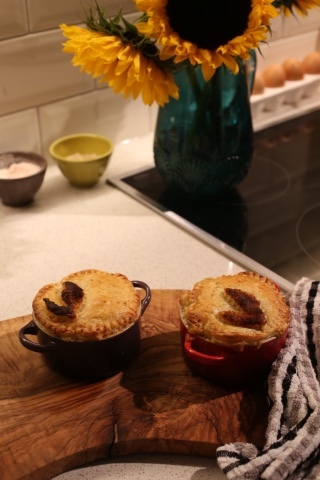 Fall/winter are well on their way and in the UK that could mean long wet and blustery months without sunshine and I'm hoping these pot pies will be my saving grace. 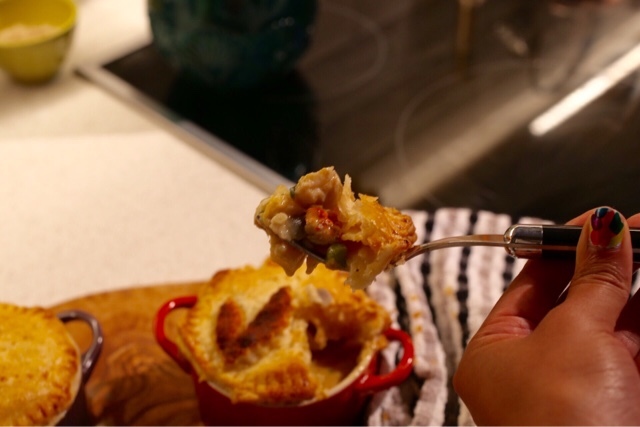 Not only are they toasty and comforting but lobster always takes me back to beachy summer days. A nice little vacation in every bite. 1.) In a large pot, sauté the onion and fennel in the butter till soft then add the garlic and sauté for 1 minute more. 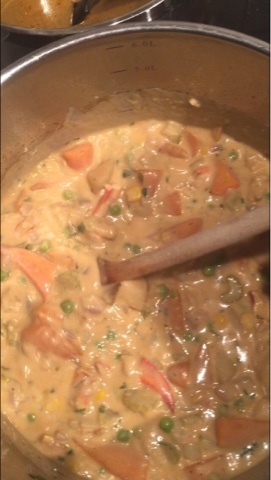 Now add the potato, carrot and celery and cook for 1 minute. 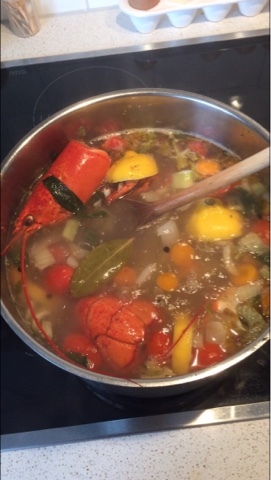 Pour in the lobster stock, dry sherry and old bay and let simmer on medium heat for about 20 minutes. Slowly stir in the cream. Once well mixed, stir in the thickening liquid and keep string till you notice thickening. If it's not as thick as you'd like add more thickening liquid one tbsp at a time. 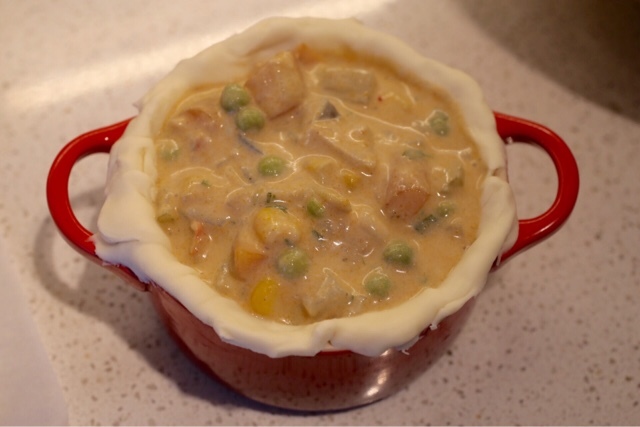 Once it's reached you preferred thickness remove from heat and stir in the peas, corn, lobster meat and parsley. Add s&p to taste and let cool. 2.) Preheat oven to 220c/430f. 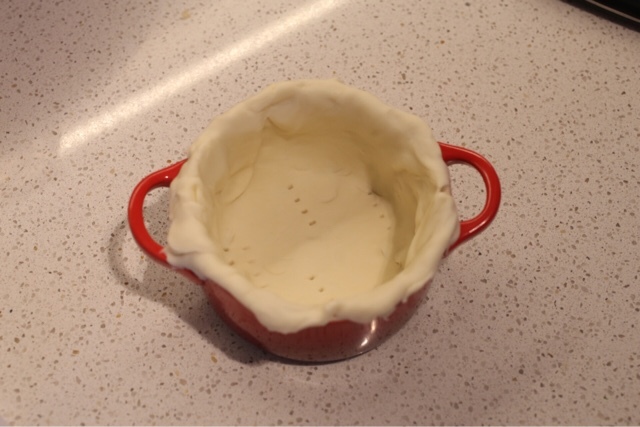 Press the puff pastry dough into either individual ramekins or 2 pie pans. 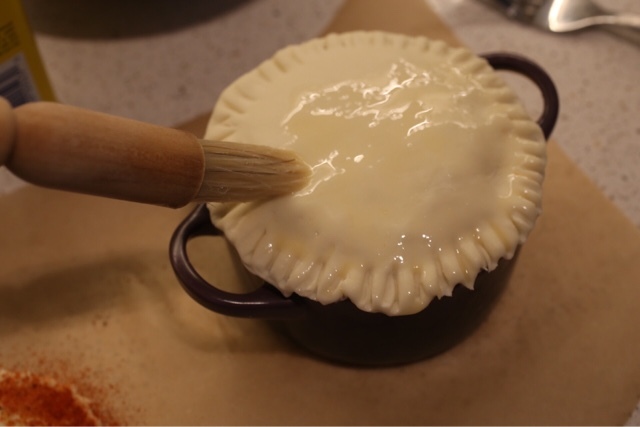 Pour cooled filling into the pastry then cover with another sheet, crimping the edges to seal it shut. Brush with egg wash, poke a few holes with a fork and bake for 25-30 minutes or till crust is golden. To make these fun little lobster claw decorations just free-hand cut out the shape, brush with egg wash and sprinkle with old bay and paprika. 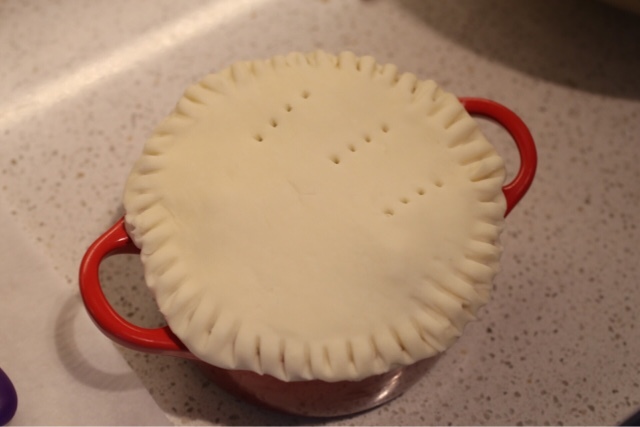 Attach to the egg wash brushed tops of the pies. All you need is 3 Tbsp olive oil, 2 cleaned out whole lobster shells or 4 lobster tail shells, 3 chopped celery stocks with the leaves, 2 chopped carrots, 1 chopped onion, 1 chopped fennel bulb, 4 halved garlic cloves, 3 litres water, 1 sliced lemon, 2 handfuls fresh whole grape tomatoes, 1 Tbsp peppercorns, 2 tsp dried thyme and 3 bay leaves. 1.) sauté the first 6 ingredients in olive oil till everything but the shells are soft. Add remaining ingredients and let simmer uncoverered till the liquid reduces by half (up to 2 hours) Don't forget to stir occasionally to really get the flavors infusing. 2.) 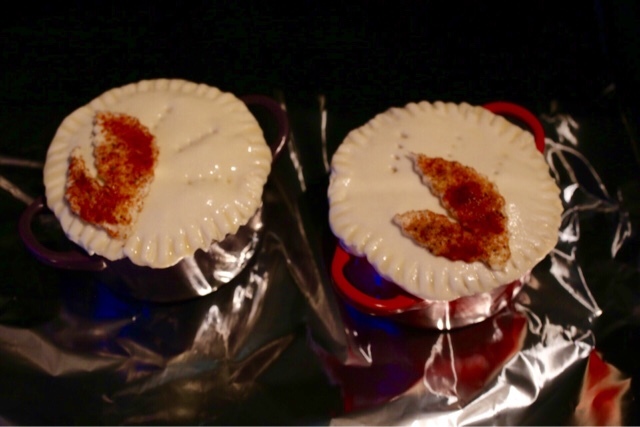 remove from heat and let cool slightly before straining out all the solids. 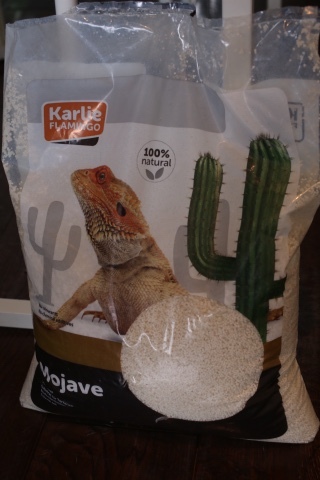 Can be frozen for 3 months. After a recent week in Italy and about a thousand pounds of pasta....let's just say I needed a carb break! 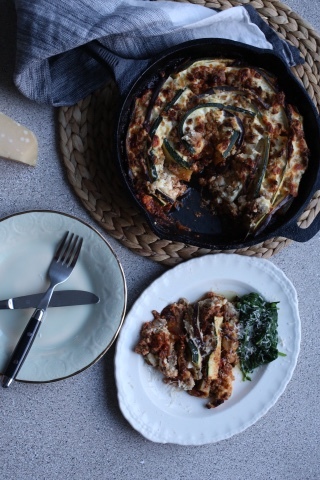 So I started experimenting with Italian recipes that don't require pasta but still have that special oomph and this lasagna swirl DEFINITELY has it. 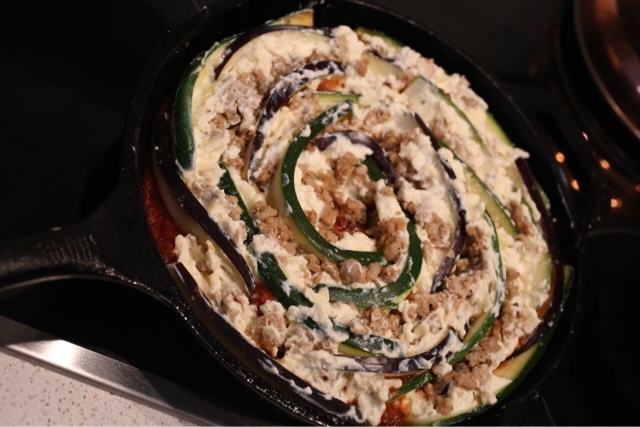 Constructing the swirl is very hands on and a little messy but the result is b-e-a-utiful. And let's not forget that messy can sometimes be fun. 1.) Preheat oven to 375f/190c. 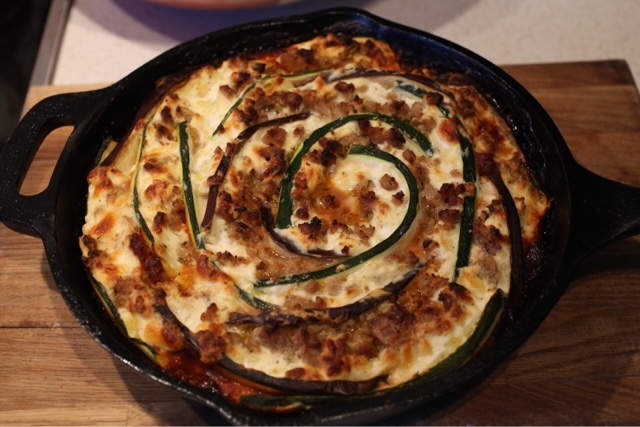 In an oven proof skillet, brown the sausage and break up into small pieces. Remove from skillet and reserve for later. Use drippings to sauté the onions and garlic for about 2 minutes. 2.) 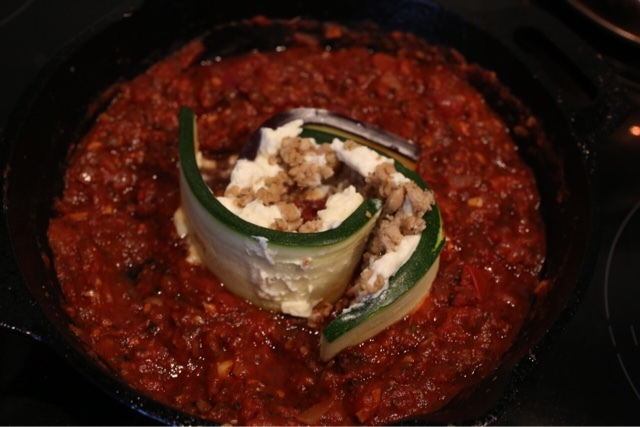 Add canned tomatoes, tomato paste, italian herbs, fennel seeds, chili flakes and salt and pepper to taste. Stir till well mixed and remove from heat. 4.) 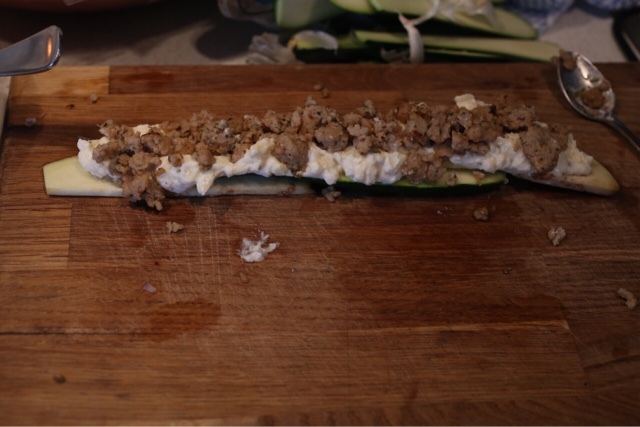 Repeat step 3 with the remaining zucchini, eggplant, ricotta mix and sausage except add the strips (still in threes) to the outer layers of the center spiral. Keep building till the layers fill the skillet. 5.) Bake uncovered for 45 minutes in the center of the oven. 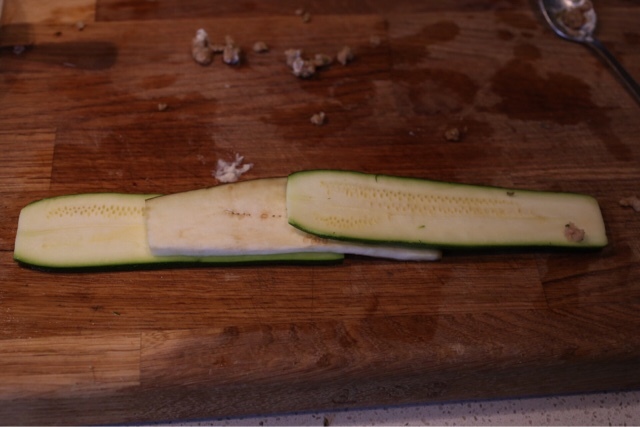 Once done let stand for a few minutes before cutting in. Enjoy!